Man should get a prize for enterprize! A man bought a first-class ticket and used it to have free meals and drinks at an airport’s VIP lounge almost every day for nearly a year. 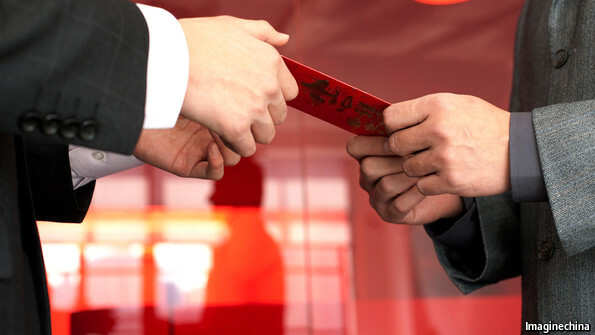 The itinerary for the ticket was found to have been changed more than 300 times within a year, and the owner of the ticket used it to enjoy the facilities at the airport’s VIP lounge in Xi’an in Shaanxi, China. The case was discovered by a China Eastern Airlines staff member, who then decided to investigate. via Nothing To Do With Arbroath: Man used first-class airline ticket to get free meals in airport’s VIP lounge for almost a year. The thrum of motorcycles echoes over a Chinese mountain road, where hundreds of thousands are shunning public transport to take the highway home during the world\’s largest annual human migration. China\’s 245 million migrant workers – twice the entire population of Japan – generally have to travel on jam-packed trains or buses to get to their hometown to see their families for the Lunar New Year. But this year more than 600,000 are expected to ride by motorcycle, according to state-run media, making gruelling journeys of several hundred kilometres for the country\’s biggest festival, while a hardened few are even cycling. \”I\’m excited, I want to get back home as soon as possible,\” said Mo Renshuang, a shoe factory worker who stopped to stretch his legs at a rest stop several hours into his 700 kilometre (430 mile) trip.He was heading from Guangdong, one of China\’s richest provinces, to Guangxi – one of its poorest regions. via The motorcycle migration: The Chinese shunning public transport in quest to get home for Lunar New Year | South China Morning Post. CHINA is the world’s biggest polluter, so it is no surprise that it fares poorly on some measures of pollution in a new global index of environmental performance. The shock is that it also stands out for its world-beating greenness in other areas on the same index. The Environmental Performance Index (EPI), a joint product of America’s Yale and Columbia universities, is the latest volume in a long-running biennial ranking of 178 countries on a variety of measures of environmental performance. New this year are assessments of performance in waste-water treatment and combating climate change, as well as the clever use of satellite data (to track trends in forestry and air pollution) in order to top up traditional computer modelling and official data. The report’s conclusions are more cheerful than most green report cards. The experts believe countries are doing well in improving access to safe drinking water and sanitation, and in bringing down child mortality. However, the global trends are worrying in other areas like fisheries, wastewater treatment and air quality. Overall, Switzerland came out top. Somalia came last. China was 118th, a middling ranking that beats India (155th) but falls well below South Africa (72nd), Russia (73rd) and Brazil (77th). However, that average masks a huge divergence in China’s performance in two areas. Using satellite data, the boffins worked out, for the first time, what global exposures were to fine particulate matter (known as PM2.5) from 2000 to 2012. China ranked at the bottom on air pollution, with nearly all of its population exposed to levels of PM2.5 pollution deemed unhealthy by the World Health Organisation (WHO). Though less frequently criticised than Beijing, Delhi’s air is also terrible—but China as a whole fares worse. In 2012 the average human exposure to PM2.5 for all of China was 48 micrograms per cubic metre, but the national figure for India was only 32 units (the WHO says anything above 10 units is unhealthy). The surprise is that China has done very well on carbon. The experts calculate that, unusually among big emerging economies, it slowed the rate at which its greenhouse-gas emissions have grown in the past decade. That is partly a natural result of its development, which has led to investment in better technology and cleaner industries, but it is also thanks to policies to improve efficiency and boost renewable energy. Environmentalists the world over can breathe a little easier knowing that the biggest global polluter has started to slow the rise in its greenhouse-gas emissions and may one day even reduce them. 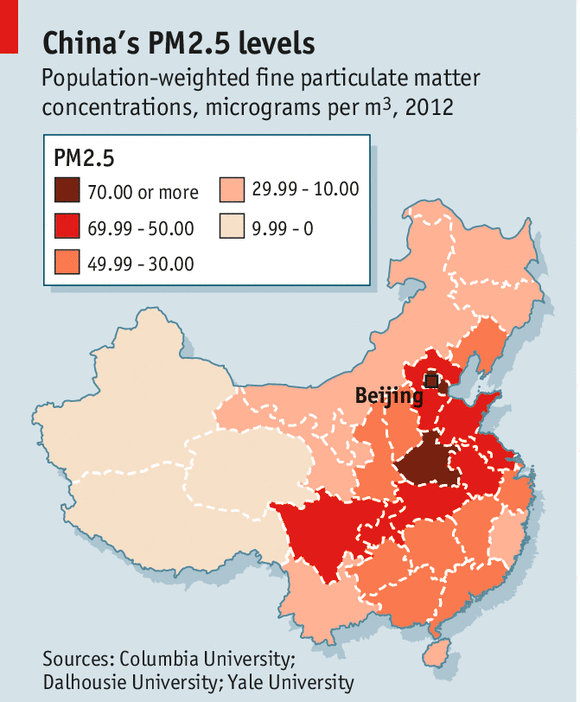 If only China’s urban residents could breathe a little easier, too. via Environment: Browner, but greener | The Economist. The Year of the Horse, which begins Friday, is a dangerous one for investing, according to Master Koon, a Hong Kong-based feng shui master. The Chinese zodiac runs on a 60-year cycle, as the 12 animals occur in combination with each of the five elements of traditional Chinese cosmology: wood, water, fire, metal, and earth. The “wood horse,” which is up this year, represents “instability and disruption,” Master Koon said. A previous wood horse year, 1894, saw war break out between China and Japan – hardly an auspicious sign. 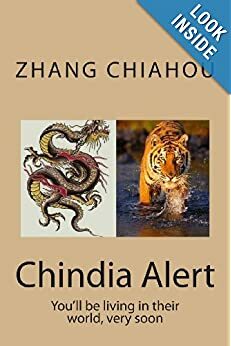 Master Koon’s analysis flatly contradicts that of brokerage CLSA, which argued in a recent report that the Year of the Horse would be a good one for stocks. Based on its own survey of five feng shui diviners, CLSA calculates the Hong Kong stock market’s benchmark Hang Seng index will likely rise 28% over the next year. It seems the masters of feng shui are no more in agreement than professional economists, whose prognostications for China’s growth vary from an export-driven resurgence to financial meltdown. It isn’t clear which profession has a better record of forecasting. 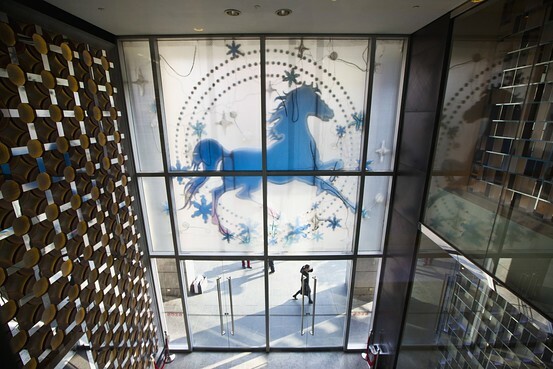 via Feng Shui Masters at Odds Over Prospects for Year of the Horse – China Real Time Report – WSJ. Lenovo Group said on Wednesday it agreed to buy Google Inc\’s Motorola handset division for $2.91 billion, in what is China\’s largest-ever tech deal as Lenovo buys its way into a heavily competitive U.S. handset market dominated by Apple Inc. It is Lenovo\’s second major deal on U.S. soil in a week as the Chinese electronics company angles to get a foothold in major global computing markets. Lenovo last week said it would buy IBM\’s low-end server business for $2.3 billion. The deal ends Google\’s short-lived foray into making consumer mobile devices and marks a pullback from its largest-ever acquisition. Google paid $12.5 billion for Motorola in 2012. Under this deal the search giant will keep the majority of Motorola\’s mobile patents, considered its prize assets. via Lenovo to buy Google’s Motorola in China’s largest tech deal | Reuters. The Mongolian steppes was where Chinese president Xi Jinping offered his televised New Year’s greeting as Chinese people worldwide celebrated the year of the horse with fireworks and feasting. 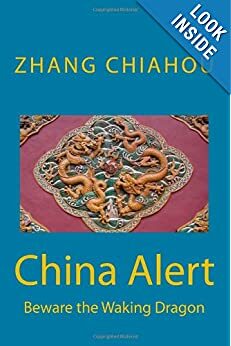 While the content of his message varied little from previous years, the choice of setting shed light on the great strains confronting today’s China. And this year, the message was pollution. The lunar new year, which began on Friday, is the main holiday in the Chinese calendar. Far-flung families, gathered for holiday meals, inevitably tune to state television, which this year emphasised Mr Xi’s theme of a “Chinese dream” and urged viewers to lay off on fireworks in order to reduce pollution. Urging “continued struggle with one heart and mind” and prosperity for the motherland, Mr Xi did not address specific policies directly. But Chinese leaders’ New Year’s visits often coincide with priorities for the year ahead, including visits to coal miners, Aids patients and impoverished country villages. This year the wide-open grasslands framed behind Xi’s dark winter coat and black fur hat are a fitting symbol for the country’s new focus on pollution, which clashes with its enormous appetite for coal. The herders applauding Mr Xi in the freezing wind at Xilin Gol, Inner Mongolia, have been on the receiving end of a black gold rush, as state-backed mining companies from richer provinces rip up the grasslands in search of coal. China’s leadership is now trying to reduce coal pollution in wealthier cities, but renewed plans for coal development in the north and west could cause new stresses in arid and ethnically distinct areas like Xilin Gol. via China’s Xi Jinping calls for less pollution in year of the horse – FT.com. 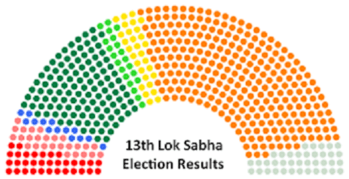 Aam Aadmi Party on Thursday said it will contest over 350 Lok Sabha seats (total 543 seats) and vowed to take on tainted candidates and political leaders who have become \”symbols\” of corruption and criminalization of politics. The fledgling party, which made a stunning debut in the recent Delhi assembly polls, said it would contest elections against 14 Union ministers as well as A Raja allegedly involved in the 2G spectrum scam. \”We have received reports from our state conveners and looking at the response from different seats, it has been decided that the Aam Aadmi Party will contest more than 350 seats in the Lok Sabha elections,\” senior party leader and political affairs committee (PAC) member Sanjay Singh told reporters. via AAP to contest over 350 LS seats, will fight tainted leaders – The Times of India. SOMETHING has gone sadly wrong with Yutu, the lunar rover that China successfully launched and placed on the surface of the moon in December. But something has also gone very right with the way authorities have chosen to talk to the public about the setback. Officials have found a playful and, for China, very unusual way to break the bad news that the rover has malfunctioned, and that its operating life is probably coming to a premature end. In addition to a straight news report about the malfunction, the state-run Xinhua news agency reported (in Chinese) on a “diary” in which the rover (pictured) delivered a feigned first-person account of its situation. 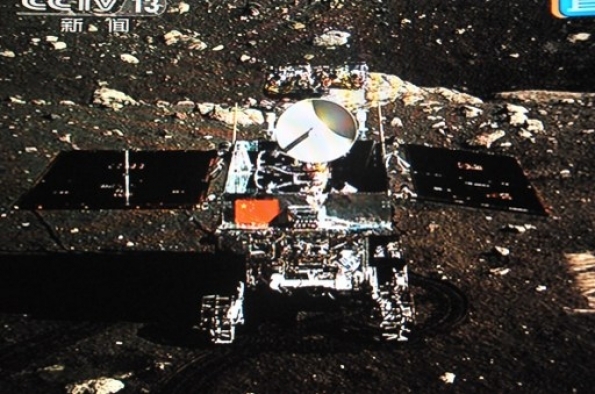 The good news was that Yutu (or Jade Rabbit, a figure in Chinese lunar mythology) had travelled more than 100 metres on the lunar surface, and that its radar, cameras, particle analyser and infrared spectrometer had all collected valuable data. This innovative communications approach has earned admiring and warmhearted coverage in Western news media. It has also inspired a vast outpouring of supportive and sympathetic messages on Chinese social media, where the response to official news is often cynical and contemptuous. via China’s lunar rover: Well played, sir! | The Economist. FOR a sense of how President Xi Jinping’s anti-corruption campaign is doing, a recent report by Xinhua, the official news agency, is a good place to start: it said that 56 five-star hotels in China had asked to be downgraded last year in order to survive, as local governments have been prohibited from using luxury hotels. Chen Miaolin, chairman of New Century Tourism Group, told Xinhua that revenues at his group’s (mostly five-star) hotels fell by 18% last year. In big cities business is down at many of the best private clubs and restaurants. A number of luxury brands have reported sharp falls in revenues. Rémy Cointreau saw sales of its flagship cognac fall by more than 30% in the last three months of 2013 over the previous year, mostly owing to falling Chinese demand. The campaign begun more than a year ago by Mr Xi has been surprisingly broad and sustained, and is intensifying as it enters a second year. The Central Commission for Discipline and Inspection, the party’s watchdog, says that 182,000 officials were punished for disciplinary violations in 2013, an increase of more than 20,000 over 2012, and of nearly 40,000 over 2011. Thousands of officials have been disciplined for extravagances such as hosting lavish banquets, weddings and funerals, spending public funds inappropriately on travel, the improper use of government vehicles and constructing luxurious government buildings. But two recent developments illustrate the difficulty and sensitivity of the task the party has set itself. On January 21st a report by a team of media outlets led by the International Consortium of Investigative Journalists (ICIJ), an American organisation, revealed the secret offshore holdings of close relatives of some of China’s elite, including Mr Xi’s brother-in-law and the son of Wen Jiabao, the former premier. Then on January 22nd authorities began criminal trials in Beijing of independent anti-corruption activists who campaigned for, among other things, public disclosure of official assets (see article). 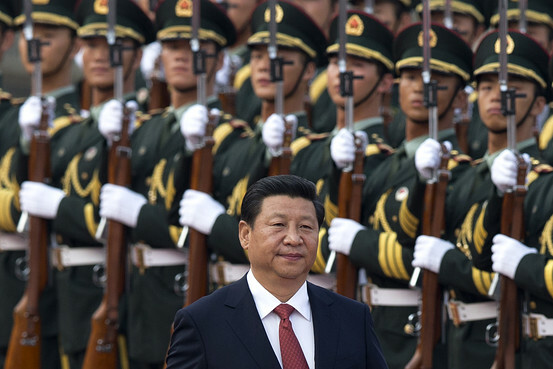 The message from Mr Xi is that the party, and only the party, will patrol itself, and is perfectly capable of doing so. But the ICIJ report hints at the failures during decades of self-policing. via Corruption: Less party time | The Economist.